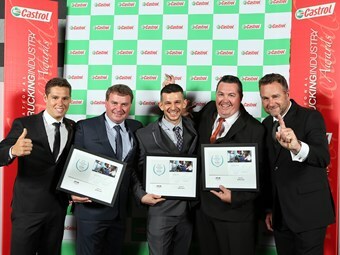 The finalists for this year’s top truck workshop manager award have all implemented impressive safety measures. Craig Rosender Award finalists Damien Allison from De Bruyn’s (second from left), John McKnight from Blenner’s (centre) and Christopher Knijff from Easter Group. On the outside are award ceremony speakers ProDrive racing CEO Tim Edwards (far right) and driver Cameron Waters (far left). One of the highlights of this year’s Technical and Maintenance Conference in Melbourne was learning how some top workshops have improved their safety levels. Safety benefits can come from technology as simple as protective glasses and gloves. Damien Allison won this year’s Craig Roseneder Award for Technical and Maintenance Excellence in the Workshop. He received the award at last month’s 2015 Technical and Maintenance Conference (TMC). Allison, from Tasmania’s De Bruyn Transport, oversees five tradespeople and three apprentices. He says De Bruyn’s has dropped its workshop injury rate down to "pretty much zero" in recent years. Most of the injuries were to eyes, from things like hammers and pressure steam cleaners causing debris to fly up. The solution was hardly rocket science: protective glasses. "We didn’t want to go down the line of 100 per cent safety glasses in the workshop," Allison adds. "We still want to be normal." That other simple safety technology – gloves – has also prevented the cut injuries which used to be a risk with fabrication work. "We also did have a young workforce when our injury rates were up … Now we’ve got more tradespeople, and that also assists," Allison says. Meanwhile De Bruyn’s follows the manual handling policy one of its big customers, BlueScope Steel. The other best workshop manager finalists at the TMC also had some interesting things to say about safety. Christopher Knijff from Easter Group at Wacol in Brisbane has introduced a new roller brake tester and shaker regime; has implemented a gate hanger policy to reduce the risk of falls; and has redesigned the workshop to improve safety. For example there is now a tyre safety bay at the back of the workshop to reduce the risk of explosions. "Every time we had to inflate a tyre or change a tyre, we had to roll it through the workshop," Knijff recalls. "That creates hazards, so we actually moved that right away from everyone else, and we are using a safety cage." John McKnight is in charge of trades staff with Blenners Transport at South Mission Beach in north Queensland. "I suppose my biggest fear is killing someone outside our door or inside our workshop," McKnight says. He has what he calls five "fatal risk controls", identifying key areas in the workshop that have the possibility of inflicting serious injury or death, including out on the road. These include interaction between vehicles and pedestrians, through to fitness for work. Blenners also has what McKnight calls a "peer-review" process for safety-critical items, involving two people signing off on work orders. "It’s a massive amount of labour, the guys probably don’t like doing it, but it ensures that the quality out on the road is a lot higher than what we were seeing previously," he says. McKnight says Blenners also has random spot-checks by the foreman and senior technicians. You can read the the full feature on the 2015 Craig Roseneder Award finalists in the December issue of Owner//Driver.